This is the fifth title in the ‘Kingdom’ series of what is projected to be seven books progressively sharing insights into the esoteric realities of Eternity, setting out in unequivocal and simple-to-grasp-and-apply terms, the ease with which we can join in holy communion with Jesus and the Holy Spirit, and receive Their Help to forgive and heal the karmic issues that have beset the fragmented Sonship of God since time began. Sharing the Kingdom Within shows how we all can escape from the valley of the shadow of death that is this dream world, and even while we seem to be still in the divided, conflicted world, we can choose to be not of it – just as Jesus counselled us in the long ago, and just as he functioned during his embodied world-saving mission, which now moves deeper into the completion of the Great Awakening of us all back to our true, unified state as Papa’s One, beloved Son. I counsel you, in your heart draw close to me, that I may put upon you the cloak of my Love and the crown of your glory; that the Light within you may burst forth into the dark corners of your life and of your fellows and show to you there is truly nothing to fear. Hold fast to that which you have been given, that your crown be not taken from you; nay, rather that it may be embellished with all the jewels for which it has been prepared. In me and by me is this accomplished, for I have overcome the world, and it is the Father’s good pleasure (and mine also) that you should receive the Kingdom. By my overcoming shall also be your overcoming. This is my command, given by the Father, that all the little ones of Earth be lifted up. (January 9, 1994). It is His great desire that all who Love Him should enter into the Holy of Holies, the Holy Presence, and become, once more, His children, crowned with the jewelled crown of their own accomplishment. (October 1, 1995). Do not falter in your patience and fortitude. The ego would have you stumble even at the very last hurdle. Do you think I do not know this? Keep your focus always upon me. Let patience be a jewel in the crown of your glory. (May 31, 1998). He and/or the Holy Spirit will lead each of us as much as we are willing to entrust ourself into Their perfect, Loving care and leadership. That leading will, assuredly, gently, ably, safely, effortlessly direct and safeguard our journey. As our ascent into the Light of eternal Truth progresses, so is our view of reality increasingly illuminated, and our commitment to continuing on this Path raised commensurately, to the point where we have a consuming desire to share the mystical Truth that is so wondrously, indispensably, magnificently contributory to the effecting of our spiritual Awakening. By the very process of sharing the Kingdom within, so do we ascend the Hill of the Lord, and the ascension becomes easier and easier – not more arduous, as when climbing a hill or mountain in the world of separation consciousness with a mortal body. It becomes easier because we become Lighter, less burdened, less weighed down and slowed down by the baggage of misperception. We become less confused between reality: eternal – and unreality: temporal. Less confusion means fewer twists and turns; our path becomes straighter, plainer, clearer, our sense of direction more assured. Becoming Lighter means our Light is less subdued, veiled, masked by illusion, so shines more brightly, thereby attracting more brothers who are ready to receive of our sharing of the Kingdom. By sharing we remember (or learn) more, so our awareness of and conscious access to the treasure house Papa shares with His creation increases. Therefore are we able to share yet more. The more we share the more we receive because we are sharing ideas, not stuff. Sharing stuff means we have less stuff, but sharing ideas means they increase and strengthen in our mind by the sharing. This book doesn’t have to be read from front to back. The Introduction and the Afterword, when read together before reading the chapters inbetween, gave me a clear sense of its love-and-spiritual-Truth-filled principles. I then used the chapter that I felt drawn to as inspiration for that day. The words penetrated my heart and mind and I always felt more focused on what is truly important in life. I shall continue with this, using the chapters to deepen my spiritual practice for my prayers and meditation. Thank you, Brian, for another literary, spiritual gift helping us on our journey Home. This book is packed with deep mystical material that never strays from its focus on our spiritual Awakening. It accords perfectly with A Course in Miracles, yet powerfully, cogently, adds insights on just about every page that help comprehensibility of the Course. As the subtitle indicates, this book helps our ‘Ascending the Hill of the Lord’, and as Jesus reminds us in the Course, “… together, or not at all”. It palpably engenders a level of inner peace, joy and Love of which this world as yet, has no understanding. Until I picked up one of Brian’s books I had no resonance with ‘Jesus’ or ‘the Kingdom of Heaven’. But his explanations of who Jesus really is, and what the Kingdom of Heaven actually means have proved profoundly meaningful and enlightening – liberating, even. Beyond the terminology, and the fact that this book has nothing to do with religion – but everything to do with spirituality – I found a deep, uncompromising message that is rendered applicable in, and transforming of, daily life far beyond this world’s understanding. This book affirms that I have a real, reachable friend in Jesus – communing with me with a personal, warm, all enveloping Love. The uncomplicated writing gave a gem in every topic, every chapter, with which I could spontaneously resonate. Wherever I started reading, I was brought into peace, which I could apply seamlessly in daily practise, enlivening me. I inwardly knew what was being communicated was True because it touched my Heart/Mind, my inner, higher Self. The writing tells us of what we have always known deep down – Love Is and our true Self is One within It. Reading this new and inspirational book, I was constantly reminded of the works of ‘New Thought’ writer Florence Scovel Shinn (1871-1940). In her book, The Game of Life, Ms. Shinn states, “Man has so long separated himself from his good [Self] and his supply [God], through thoughts of separation and lack, that sometimes it takes dynamite to dislodge these false ideas from the subconscious.” Brian’s book could surely be the dynamite one would need to awaken completely from the dream of separation. Bravo, Brian, on yet another spiritual masterpiece! In this volume Brian shares his mystical experiences and his contacts with Jesus. He weaves in references from A Course in Miracles as well as biblical quotes to bring life to the message he feels lovingly called to impart. As in his other writings, Brian adds a new dimension to some words, such as Papa for God. Papa brings a deep and intimate affection to our relationship with our Creator. Words are symbols of thoughts, pointing to experience. The true message beyond the words is where the resonance is! The message of our Divine Nature is beautifully conveyed in this book. This, the fifth book of the Kingdom series, is truly uplifting. Brian takes us yet further steps in our ‘ascending the Hill of the Lord’. Deep, esoteric Truths are meticulously, inspirationally brought together to help us leave the ego behind. I fully welcomed the repetition of certain – key – topics Brian has chosen to write on in greater depth. I needed this as various lessons were still not completely learnt. Brian is a knowledgeable, trustworthy and very patient, loving teacher. Every time I turn to Brian’s books my mind is renewed and re-inspired to keep shining and sharing this wondrous Light that is our natural Inheritance. On my own journey there have been steps forward, and a little stumbling at times. Yet through his writing I am brought back repeatedly to what is true and real. He does that masterfully with each beautifully crafted passage. I am grateful to Brian for the loving certainty of his teachings. Sharing the Kingdom Within is a most valuable addition to his ‘Kingdom’ series; a treasured companion on this path of Awakening. This book has a certain spiritual majesty about it, bringing us closer and closer to ultimate Truth, with so much packed in, yet with deep esoteric topics so clearly explained and easy to grasp. A radiant lighthouse and an enthusiastic guide to accompany and powerfully assist anyone’s journey back to Wholeness. Brian Longhurst lovingly shares his journey with the living Jesus through his books. I would read them in a matter of days, as I could not put them down. This one, however, has taken me the longest to finish because I had to put it down after a chapter or two to let the words settle in and connect. There are concepts he had introduced in earlier books, but here, expanding-on and reinforcing them, showing them in a whole new light, invaluably increasing my depth of understanding. Brian shows you how to see beyond the false teachings that religion has conditioned us to, to a whole new understanding of who Jesus is and who we really are. As with Brian’s previous books in this ‘Kingdom’ series, Sharing the Kingdom Within provides ‘stepping stones of Light’, with just about every page helping me understand that everything I was looking for comes from within! Even if not everything might make perfect sense right away, as Brian describes esoteric matters I realise that just reading and being committed to it is enough, because the understanding gradually emerges into our awareness as we become more attuned to it. This is very affirming that he is at-one with eternal reality. 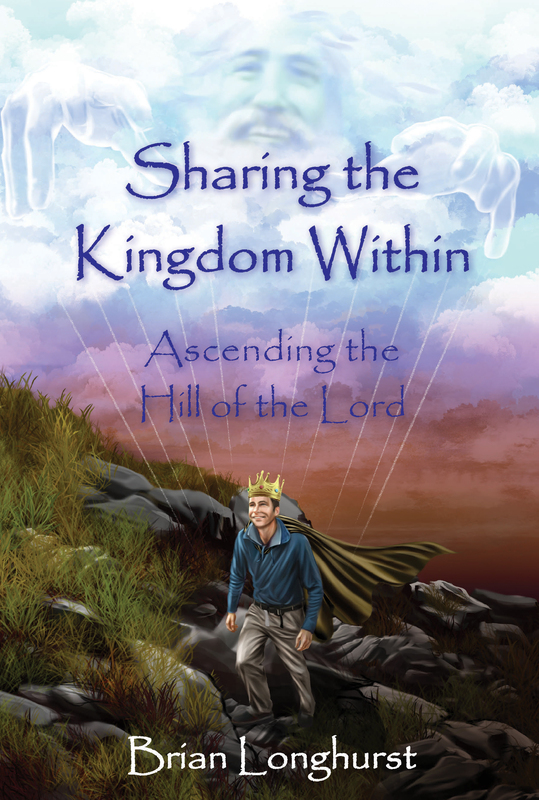 With his wonderful book, Sharing the Kingdom Within ~ Ascending the Hill of the Lord, Brian Longhurst gives us a tour of the classic spiritual journey, from questioning the nature of reality to the acceptance of the absolute truth. I couldn’t stop reading, and I highly recommend this important work. Brian communicates in words an energy that takes us into the experience of Oneness with Jesus, with God, and with all Life. He explores and shares a model for human existence, rekindling eternal Truths alive in us all, while reclaiming the unconditional Love and Light of Jesus for a new humanity. This book is an appeal to sanity, lighting the pathway from the illusion of fear to embracing our Love and divinity. So sit back, put the Divine Love and Luminous Light of Jesus in the driver’s seat, and enjoy the miracle of Life! In Sharing the Kingdom Within, I am touched and impressed by Brian’s great passion for his subject – a quality lacking in our modern humanity. Losing touch with our spirituality, we lose touch with the essentials of life. In Brian’s latest offering to a spiritually hungering humanity, his passion rises, sharing itself page after page. As it pours though his words, I am again moved to pay tribute to his unique relationship with the living Jesus. If the scriptures of Truth are within your heart, then this book is a MUST read. To read a book by Brian Longhurst is to take a sacred walk with an experienced guide. Brian is a mystic. He has been having mystical experiences since childhood. Yet he reassure us that we all have this ability. There is nothing special about speaking with Jesus. He is available to us all. This is a spiritually dynamic book. Brian focuses on the truth; chapter by chapter he reminds us that we are the Kingdom, and our kingdom includes our workplace, family, social circle and our immediate surroundings. We must share the Kingdom within for our freedom. Walk with Brian; let him stir your remembrance of what you already, inwardly, KNOW. Immerse yourself in the power of Love. This book was written in Love to all who have questions about our Truth. Brian knows the way. A chapter a day helps you work, rest, and pray! Congratulations to Brian Longhurst on delivering another true labor of Divine Love. This masterpiece provides a much-needed healing balm for the troubled spirit and for the soul within. Filled with reminders of Jesus as your gateway to Divine Peace and Love, it carries you into a heart-centered ascension to higher consciousness. With its many thoughtful chapters, you can read it once and then reflect upon its gifts of wisdom a second time… A chapter a day helps you work, rest, and pray! Owen Waters, author of The Shift: The Revolution in Human Consciousness.